WILL DARK MAGIC CLAIM THEIR HOME? Miryem is the daughter and granddaughter of moneylenders, but her father's too kind-hearted to collect his debts. They face poverty, until Miryem hardens her own heart and takes up his work in their village. Her success creates rumours she can turn silver into gold, which attract the fairy king of winter himself. He sets her an impossible challenge - and if she fails, she'll die. Yet if she triumphs, it may mean a fate worse than death. And in her desperate efforts to succeed, Miryem unwittingly spins a web which draws in the unhappy daughter of a lord. Irina's father schemes to wed her to the tsar - he will pay any price to achieve this goal. However, the dashing tsar is not what he seems. And the secret he hides threatens to consume the lands of mortals and winter alike. Torn between deadly choices, Miryem and Irina embark on a quest that will take them to the limits of sacrifice, power and love. In this fairy tale-inspired novel, Naomi Novik weaves a rich, multi-layered tapestry that is a joy to read. 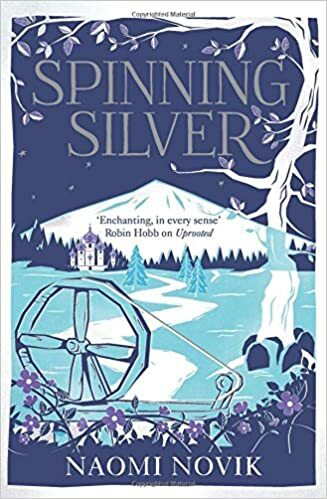 In Spinning Silver by Naomi Novik Miryen is the lead character and comes from a family of moneylenders. However her father is not a very good moneylender. He lends money but fails to collect payments. With the family in poverty Miryen decides she can do better and does. Impressed, her grandfather lends her a pouch of silver which she quickly returns into a pouch of gold. It seems as though that reputation might bring her trouble. Enter the Staryk king who wants his silver turned into gold. The Staryk prey on Miryen’s world apparent on whims at times. There is a very real threat to Miryen and her family if she fails to do the King’s bidding. In the course of Spinning Silver there is a gradually increasing cast of characters narrating from their perspective. I did find this a little confusing to start with and then realised that a small graphic at the head of a section indicated who was narrating for a while. This has a feel of an Eastern European “fairy” story and not the nice child friendly sort! There is darkness here both in the human realm and in that of the Staryk. These realms coincide particularly when the Staryk want something. They are ruthless in getting want they want and are little interested in the humans views. In part Spinning Silver is about cold and the story felt cold to me. The Staryk world is a cold one and depends on that. The ideas used in this were good as was the overall story idea. However I never became really immersed in it – for me fantasy (and stories generally) should allow that. I guess I never really warmed to the cold. Equally the characters – often with interesting stories – rarely came alive to me. Possibly Wanda – who had to work for Miryen to pay off her father’s debt – was as interesting as anyone else. There was nothing actually bad about this, it simply didn’t get to me in a positive way.